A place to remember the kitties who are no longer with us. We love them and honor them every day by loving them in our hearts and loving those still in our care. Please enjoy their stories. PJ came to Catnip Casa with his friend, Hiss, that passed before him. You can read their story below. We love this little guy for the devotion he gave his friend. The intelligence he showed in caring for Hiss and guiding him so he stayed safe on the streets and always found food. He took on a big job and did it with all his heart for the rest of his friend’s life. In turn, we honored him by taking care of him for the rest of his life. 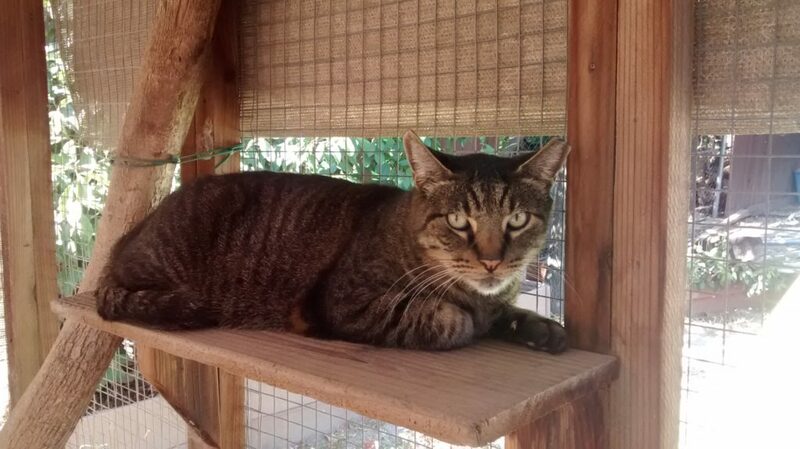 PJ loved lying on the shelf watching birds in the catio. He ran up and down the tree trunk behind him, sometimes several times before he sat a while, rather than jump to the shelf. We know Hiss was there waiting for him at the Rainbow Bridge. 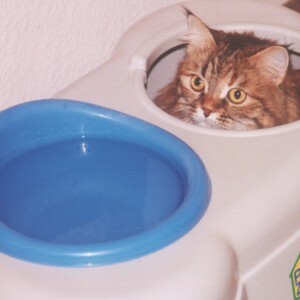 Tabbytha experienced multiple health problems all of her life. They didn’t just start in her senior years, although they worsened with age. That’s why we referred to her as special needs, as opposed to senior. Tabbytha began her young life visiting the emergency room with high fevers. Surprisingly, she outlived many other residents before sucumbing to autoimmune disease and tumors that we suspect were cancerous. By the time we found the tumors, her health was too fragile and her age too advanced to put her through biopsies or surgeries. We maintained comfort care and let her enjoy her life as long as possible. She never liked other cats, but she loved dogs. Her skill in dog training surprised us all. No dog, of any size, ever bothered her. Of course, we exercised due diligence too. Still, she ran the house, regardless of the species sharing her space. Tabby’s coat matted terribly regardless of our efforts to groom her. As a result, she received a lion cut twice a year for many years. She looked adorable. However, it was clear that she didn’t appreciate our hair style selection. Hiss was blind for as long as we knew him. He and his buddy, PJ (Prince John), lived together. They were totally bonded, and we promised we’d never separate them. Hiss was rescued when a neighbor moved after her husband died. The new owner’s were a house flipping company doing major construction renovations. Hiss and his guide-cat buddy, PJ, were no longer welcome. No one knew Hiss was blind during the years he lived near that home. The stress of age, and the confusion when his world changed, set off severe IBD that required a prescription diet. 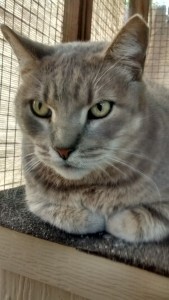 Due to his age and difficulty in locating food and litter in a new situation, along with needing a special diet, being dependent on his friend PJ, and years of living only outdoors, life on the street or in another colony was no longer possible and neither was adoption. 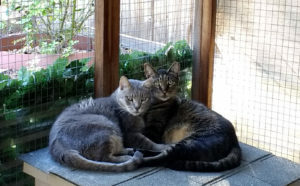 We provided them with a special catio-shelter combination to keep them safe and comfortable. Fortunately, Hiss could be handled–carefully. My favorite feature on this guy was his beautiful black eyeliner. His buddy, PJ, is very feral. Still, Hiss owed his life to PJ, from all those years PJ protected Hiss out on the street. PJ appears to be younger. So who saved whom in the beginning? If only we knew the rest of the story of how they came to be together. We lost Hiss to kidney failure. Of course, we will give PJ all our love and support for the rest of his life too. We owe him that for all that he gave to take care of Hiss for many years.